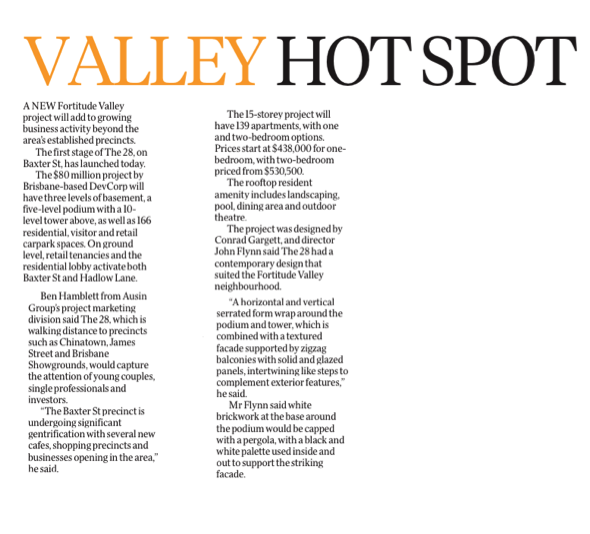 A new Fortitude Valley project will add to growing business activity beyond the area’s established precincts. The fist stage of The 28, on Baxter Street, has launched today. The $80 million project by Brisbane-based DevCorp will have three levels of basement, a five-level podium with a 10-level tower above, as well as 166 residential, visitor and retail carpark spaces. On ground level, retail tenancies and the residential lobby activate both Baxter St and Hadlow Lane. Ben Hamblett from Ausin Group’s project marketing division said The 28, which is walking distance to precincts such as Chinatown, James Street and Brisbane Showgrounds, would capture the attention of young couples, single professionals and investors. “The Baxter St precinct is undergoing significant gentrification with several new cafes, shopping precincts and businesses opening in the area,” he said. The 15-storey project will have 139 apartments, with one and two-bedroom options. Prices start at $438,000 for one-bedroom, with two-bedroom priced from $530,500. The rooftop resident amenity includes landscaping, pool, dining area and outdoor theatre. The project was designed by Conrad Gargett, and director John Flynm said The 28 had a contemporary design that suited the Fortitude Valley neighbourhood. “A horizontal and vertical serrated form wrap around the podium and tower, which is combined with a texured façade supported by zigzag balconies with solid and glazed panels, intertwining like steps to complement exterior features,” he said. Mr Flynn said white brickwork at the base around the podium would be capped with a pergola, with a black and white palette used inside and out to support the striking façade.